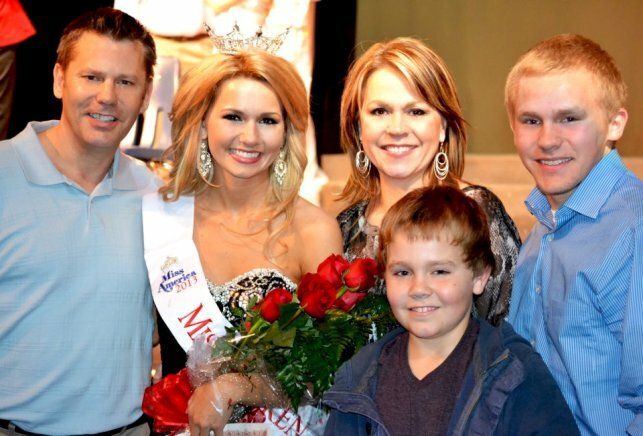 Dean Berg, Kelsie Nikole Berg “Miss Broken Arrow” Jill Agee-Berg, Austin Berg and Nik Berg. Kelsie Berg, a 2012 graduate from Broken Arrow, is 1 of 10 finalists whose video was chosen for the National Dr Pepper $100,000 Scholarship Giveaway. Dr. Pepper offers these scholarships as a way to help students nationally fulfill their dreams by paying for college tuition. Of the 10 finalists, the top 5 video vote getters will get the chance to compete for $100,000 in college tuition with an all expense paid trip to the Discover BCS National Championship Game on January 7th in Miami, FL. Fans decide – Fancs can help one of Oklahoma’s own make the top 5 by voting daily until December 17th. To vote for Kelsie, go to www.DrPepperTuition.com from your laptop or desktop computer (no cellphones). In the top 10 finalists, look for Kelsie Berg’s video (she’s the lawyer). Her link is http://www.drpeppertuition.com/entry/54. The top 5 finalist videos with the most votes will win an all expense paid trip to the BCS Bowl National Championship Game to throw for $100,000 in college tuition. Kelsie will also get 1 bonus vote per day if you Tweet #TuitionForKelsie. Note: You must have a public Twitter profile for Twitter votes to count. You can vote everyday until December 17th!!! Go Kelsie!! Go Oklahoma!! Go Dr. Pepper!! Kelsie is the daughter of Dean and Jill Berg in Broken Arrow Oklahoma. Dean is the owner of OnFirstPage.com an SEO & Web Development Firm. Kelsie is a 2012 grad of Broken Arrow and is attending the University of Oklahoma. The family has been involved at Rhema Bible Training Center. This entry was posted on and is filed under Advertising, Blog, Business Networking, In the News, Public Relations, Search Optimization, Social Media Marketing, Twitter Marketing. You can follow any responses to this entry through the RSS feed. You can leave a response, or trackback from your own site. You have my vote! Jeremiah 29:11! Thanks Machelle…big news…..coming in 3 hours………see the new blog about to hit National news….